Staring unflinchingly into the abyss of slavery, this spellbinding novel transforms history into a story as powerful as Exodus and as intimate as a lullaby. Sethe, its protagonist, was born a slave and escaped to Ohio, but eighteen years later she is still not free. She has too many memories of Sweet Home, the beautiful farm where so many hideous things happened. And Sethe’s new home is haunted by the ghost of her baby, who died nameless and whose tombstone is engraved with a single word: Beloved. Filled with bitter poetry and suspense as taut as a rope, Beloved is a towering achievement by Nobel Prize laureate Toni Morrison. Wow. I mean, what is there to say? Beloved is a haunting, suspenseful, painful, powerful, gothic novel. Sethe is a deeply disturbed and heartrending character, based on a real-life fugitive slave Margaret Garner, who fled to Ohio and was pursued by bounty hunters under the Fugitive Slave Act of 1850. Garner killed her baby daughter rather than allow her to grow up in a life of slavery. Beloved explores the main themes of maternal bonds, and psychological damage done by slavery to individuals and communities. Sethe is a pretty messed up mom. After all the unspeakable horrors Sethe endured at Sweet Home, she’s severely emotionally stunted, with little to no sense of her own identity. Denver, Sethe’s younger daughter, is a recluse, terrified to venture out into the community. Sethe is not really being the mother that Denver needs. Paul D, another former slave from Sweet Home, joins them in Cincinnati and brings with him a sense of reality, urging them to have a life with some semblance of normalcy. They go to a fair, and on their way home they meet a mysterious woman calling herself Beloved. Sethe is enraptured by the young woman, believing her to be the ghost of the daughter she killed almost two decades earlier. Anyway, things get really dark and weird, but totally captivating. 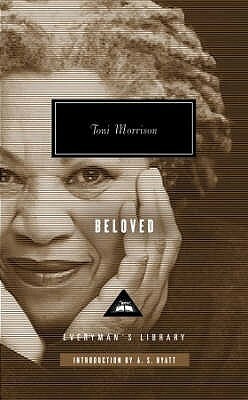 I have wanted to read Toni Morrison for a long time, and Beloved was my first book of hers. I’m actually really glad I listened to this on audio, read by Morrison. I think her pacing and affectation of her own expressive, poetic prose is just about perfect and stays with you. Listened to audiobook from August 7 to 11, 2013. This entry was posted in books and tagged audiobook, drama, family, female adolescence, fiction, history, horror, literature, magical realism by kristin @ my little heart melodies. Bookmark the permalink. I first read this as an undergraduate and I have re-read it three times since then and it still ranks as one of the most difficult books I have ever read. Emotionally and intellectually. I have also read Sula and The Bluest Eye, both of which I would recommend. I absolutely agree—a difficult book, but totally worth it. I look forward to reading more Morrison in the future, and I’ll mark down Sula and The Bluest Eye for sure! Toni Morrison definitely does not shy away from the hard topics in any of her books, but she does it so beautifully. I just saw this comment! Agreed—and hearing her words read by her own voice was an amazing experience, especially the “You are mine” poem-thing at the end there. Chilling.